Last night, Slate published an article by Guy Branum about how it is "stupid" for the Clintons to continue to overly-protect their daughter, Chelsea. Branum tells readers that he's a journalist. But in my opinion, the article makes it clear that he isn't a serious one. I base that on his silly argument that because the word 'pimp' is used in popular culture, it is therefore mainstream in ways that go beyond sexual, and so it is appropriate to use in serious political analysis on national television. His point that the chinese wall around Chelsea Clinton is a valid one. But the rest of his article is frankly, garbage. I would argue that Mr. Branum is a comedy and entertainment writer first (some of his writing I like, actually), plus as a quasi-journalist on the side. He has had several tiny claims to fame, beginning in 1997. Back then, he was a writer for his university paper, and he made a bad joke about wanting to see Chelsea butchered in-time for the big football game between his UC Berkeley and Stanford (where Chelsea spent her undergrad years). The Clinton's called the Secret Service to search his apartment and talk to him. Unfair? Probably. The quote that got him in trouble was, "show your school spirit on Chelsea's bloodied carcass." But that probably helped his reputation as a comedian, and led to post-graduate jobs today, such as a senior writer and producer for the G4 network, and a co-writer for Chelsea Handler's late-night comedy/talk show on E! (which her boyfriend just happens to control - fancy that). But let's look at the valid topic he raises and the topic he fails to raise. I’m sorry, I don’t talk to the press and that applies to you, unfortunately. Even though I think you’re cute. 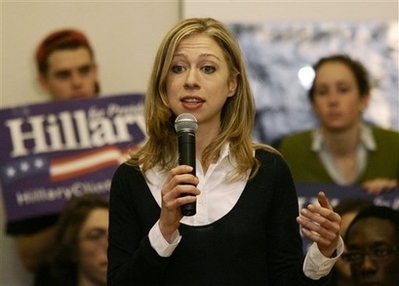 When Bill was first elected, Chelsea was 12; treating her with special deference made sense. Now she's 28. She's old enough to vote, get drunk, and run for Congress. Her mother is running for President and will not end the war. That much is clear. Senator Clinton also fully supports women in the military, including in combat. The media, and many Americans, have Asked The Question of Jenna Bush, and she has answered it. Assuming you are eligible to serve in our military, have you considered volunteering for military service? If so, what resulted from your deliberations? Ask Chelsea the question. If Jenna Bush can answer it, then so can Chelsea.